Wow. Eight months. Somehow, that just seems so much older and more mature than 6 months or 7 months. I can hardly believe we’ve made it this far already. You are really coming into your own. You are developing a real personality, and just starting to act more like a tiny human in every way. You are really figuring out your world and starting to actually THINK about it, rather than just experience it (it’s amazing to see those little wheels turning!). You see things you want and figure out how to get them. You are starting to put two and two together, seeing cause and effect and causing a lot to happen in your little world! Even the way you look seems different now. I can’t put my finger on it, but somehow you’ve changed this month. You look more grown up, more like an older baby than an infant. One of the things I’ve realized this month is your general pattern of development. You’ll get a new skill, practice the heck out of it for a few days or a week, then you won’t do it again for several weeks, until it pops back up and becomes integrated into everything you do. Like rolling. You linked rolls on your six month birthday, did it a LOT for a few days, then didn’t do it at all again until somewhere in month 7, when it just became something you did every time you were put down on your tummy or back. This is why I’m not panicking (yet) that you’ve stopped the reduplicated babbling you did so much a few weeks ago. You are still vocalizing, and still have some consonants here and there, but I feel like you aren’t going to bring back the babbling until you are ready to make it a part of daily life (maybe with a word? who knows!). Easting has been the same way, as has reading books, tummy time (early on), and lots of other milestones. As our pediatrician said, you seem to be the kind of kid who concentrates on one thing at a time until it’s perfect (hmm… sounds a lot like your daddy!). You’ve started “dancing” this month, and although it doesn’t really look like much (just you rocking back and forth), you only do it when music is on. Amazing! I guess all that belly dancing I did while you were in my tummy paid off! Most of the time, it even looks like you are rocking in time with the music, but that’s a little harder to prove. The other day, I turned on Rhapsody in Blue, probably my favorite classical composition, and you sat on the floor and stared up at the iPod/speaker dock for the entire song (sometimes dancing, sometimes playing with your book, but always looking back up to the speakers. Given that it’s twelve-and-a-half minutes long, this is incredible to me. At first I thought you were just looking at the iPod screen, but the screen eventually went black, and you still looked up (and sometimes “danced). Maybe you’ll be a music lover! Speaking of music, you’ve also started to “sing.” It’s not as consistent as the dancing, but we’ll still count it. When Daddy sings to you, many times you’ll start vocalizing right along. It’s very cute. We even did a little family harmonization once! I look forward to doing a lot more singing together in years to come. You’ve finally (FINALLY) decided you like books. You somehow learned to expertly flip the pages over and love doing so over and over. Sometimes you gasp in delight at the colors and pictures you see. Sometimes you couldn’t care less. Your favorite book right now is the giant board book of Dr. Seuss’s ABC we got at Costco (so OF COURSE it’s giant!). Many thanks to Brianna for recommending it! 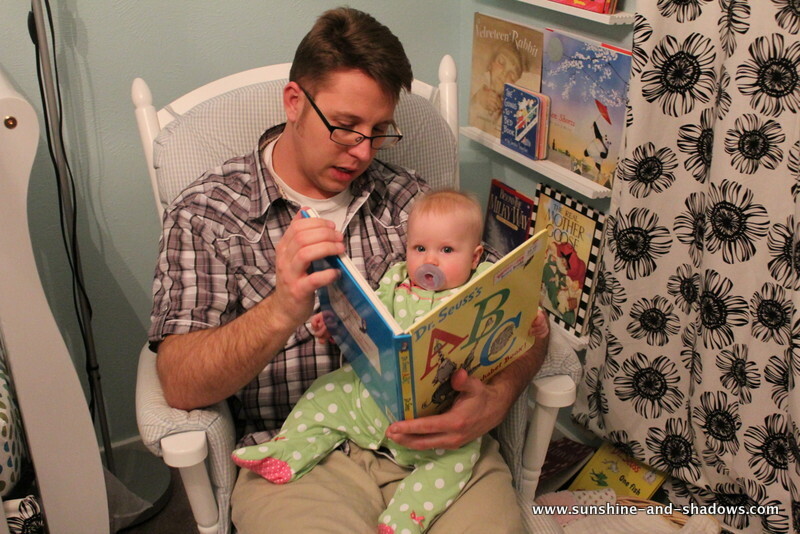 You love the giant, flippable pages and I love the funny, fun rhymes. Win, win. You also love sliding books around on the floor while rolling. You’ll also sit still in our laps while we read, which is lovely. We still usually give you another book or something else to hold so that you don’t try to grab the book from us, but you’ll sit and listen while we read. Another incredibly exciting book-related advancement (at least, exciting to me as an SLP) was imitation of my movements. We had one of those touchy-feely books (That’s Not By Bear) and I scratched the bear’s scratchy tongue… and then you did too! SO flipping exciting. Before, I would scratch and scratch that darn tongue and you’d try to eat the corner of the book. But now, at last, you can experience these fun books with all their different textures because you were able to copy me! So awesome. On the food front, the most exciting thing is that you tried a sippy cup for the first time. We’re still working on getting the concept, but you eagerly attack the spout with your mouth and will drink if we lift the cup up for you (although you refuse to hold on to it yourself). You’re eating solids more regularly and more happily now too. I still need to work on expanding your foods even more, but so far you’ve tolerated most things pretty well. I’m not sure about wheat, since we tried that over a couple days ad you slept like CRAP during that same period, but I can’t swear those things were related. We may try again after talking to the pediatrician, but we’ll see. Peekaboo. You *totally* get it. You hold blankets, books, clean diapers up to your face and pull them down when we say “Peekaboo!” and then laugh and smile. It is so much fun. You also get the biggest kick out of seeing one of us suddenly “appear” from behind a wall or doorway. Seeing your face light up like that lights up my heart. You’ve pretty much grown out of all of your 6 month clothes by now. I know we were living on borrowed time, since you are clearly NOT 6 months any longer and some of them I could still make fit if I wiggled in just the right way, but still. Your legs are so long that they bend in almost anything that has feet (even clothes that should fit up to 12 months), but you are still skinny enough that things like sweaters and such DO still fit. That said, you have definitely grown a lot this month. Many people have commented on it, and I’m excited to see how much you weight next week at the doctor’s. Come on, 10th percentile or more! I realized I want to document your daily routine for posterity, even though it’s not necessarily new this month. You wake up anytime between 7 and 9. If it’s on the earlier end, I can usually put you back to sleep to wake up at 9. I often wake up to hear you quietly playing in your crib, so I guess I don’t know when you REALLY wake up, but it’s somewhere in there. We change your diaper, nurse, I eat some breakfast while you play nearby (you are usually too grumpy if I try to feed you in the morning). By 10:30, pretty much on the dot, you are ready for your morning nap. After you wake up, anywhere between 11:15-12:30, we’ll nurse, change diaper, have some food, play, etc. etc. until your afternoon nap. This is less precisely timed, but usually falls around 2:30 or so. In the afternoon, more of the same (solid food, nursing, playing, reading books, etc.). Bedtime starts around 6:45 or 7 because you are ready for bed at 7:30. On. The. Dot. Sometimes we take a bath, then get pajamas and nighttime diaper on, then read a book, nurse and you lay down in your crib. You always have the tag blankie I made for you with you, and we turn on Sleep Sheep. You usually sleep until 12-1 AM, nurse, then sleep again until morning, although sometimes you throw an extra nursing in there. All in all, not too bad! There is one change I can’t say I’m terribly happy about, but I always knew the day would come. The only times I can really snuggle you anymore are when you are just waking up or falling asleep. Every other time, you are pushing away from me, craning your neck to look all around you, eager to engage with the world around you. Even after a nursing, when we used to have at least a few moments of snuggle time, you now pop off the breast and immediately start looking around, trying to sit up, or otherwise push away from me. Like I said, I knew it was coming, but I didn’t realize it would happen so fast. It’s only a breath away before you start running away from me out into the world. Things I love about you: Your delicate little hands, the way you touch things with your index finger at first then grab with your whole fist, your astonished and excited gasp-laughs, the way you flail your arms and legs when excited, how excited you get over the tiniest things (being carried face-out going down stairs, new animals, watching other kids play), how observant you are when we are out and about, your incredibly delicious cheeks, your eyelashes, the shape your mouth makes when about to eat a toy or book, the way you smile and flirt with us, the way you open your mouth to eat more food, how incredibly patient you are (for a baby), and the way you rest your cheek against my breast after nursing. Songs I sing to you: The Muppet Show song (“It’s time to stop the music/It’s time to turn out the lights/It’s time to get things started/For Emmie’s nap tonight); When eating: “I feel peas with my fingers/But not with my toes/Peas are all around us/They’re even up my nose” (to the tune of “Love is All Around”). Wow, so sweet. I wanted to name our daughter Emme. It goes by way too fast. My littlest is 14 months.